The wetland area surrounding the Great Swamp Conservancy (GSC) is a treasure trove of natural resources benefiting both humans and wildlife. The GSC features restored wetlands, grasslands, early successional growth, and a forest ecosystem, allowing for great biodiversity. Having diverse habitats at Great Swamp Conservancy as well as staff trained in environmental sciences and education allows us to offer a variety of hands-on, inquiry-based science programs for your students. We welcome schools groups of all grades out at the GSC throughout the year. We also offer programs to bring in to your classrooms as either stand-alone lessons or extension to your field trips. Programs: Our programs are designed to support the New York State Core Curriculum. In addition to the listed programs we offer below, we offer a variety of subjects that can be tailored for any grade level both on and off site (See Adaptable Topics below). We are also more than willing to design a lesson specific for your group. Field Trips: On-site environmental field trips vary between two and three hours in length with three rotational sessions focused on a single topic. The sessions incorporate the senses, a hand-on activity, and an outdoor component for exploration and research. In the event of inclement weather, the sessions will be held indoors. 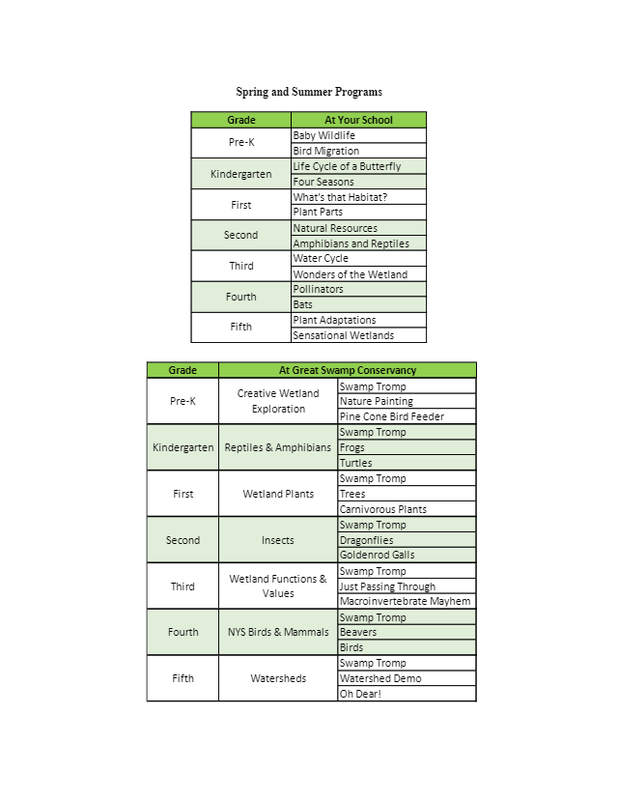 See the table below for the program offered for each grade level. At Your School: Our traveling naturalist can bring the outdoors into your classroom with our series of lessons incorporating wildlife and plant artifacts. Each grade has a choice between two programs. See below for the list of programs we offer at your school. Adaptable Topics: Bird Identification, Building Bluebird Nest Boxes ($10/kit), Camouflage, Building Terrariums(additional fee), Flowers, Goldenrod Galls, Habitats, Insects, Invasive Species, Monarch Butterflies, Owl Biology, What is a Wetland? Scheduling: The GSC is open Monday through Friday year-round from 9:00 am until 5:00 pm and Saturdays from 10am-3pm. For inquiries, scheduling, and pricing please call (315) 697-2950 or email us at greatswampconservancy@gmail.com.